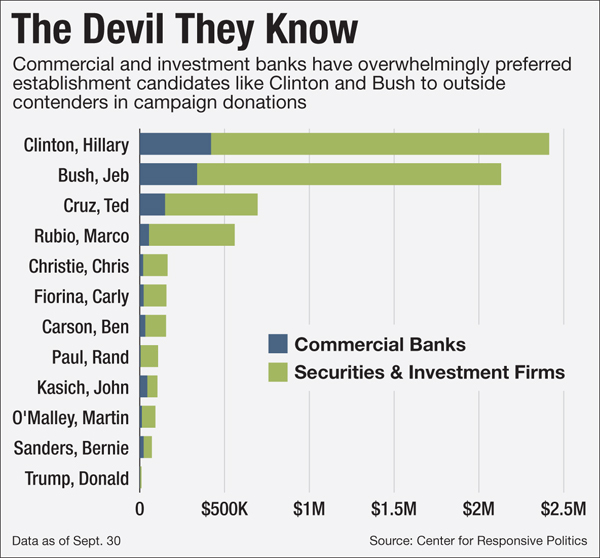 Source: Who Are Bankers Backing for President? by Victoria Finkle for The American Banker. 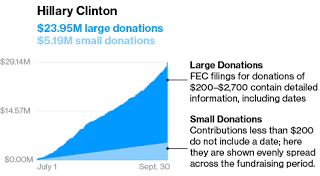 Bloomberg Business had an interesting set of charts, showing how much money the different candidates received in small donations (under $200) versus large donations. Bloomberg’s bar for small donations was lower than for some of the other charts I’ve published on this web log. Some of what the writers consider “large” donations aren’t all that large. Nevertheless, Boomberg’s figures give a general figure of which candidates raise significant amounts from the general public and which depend on the wealthy. 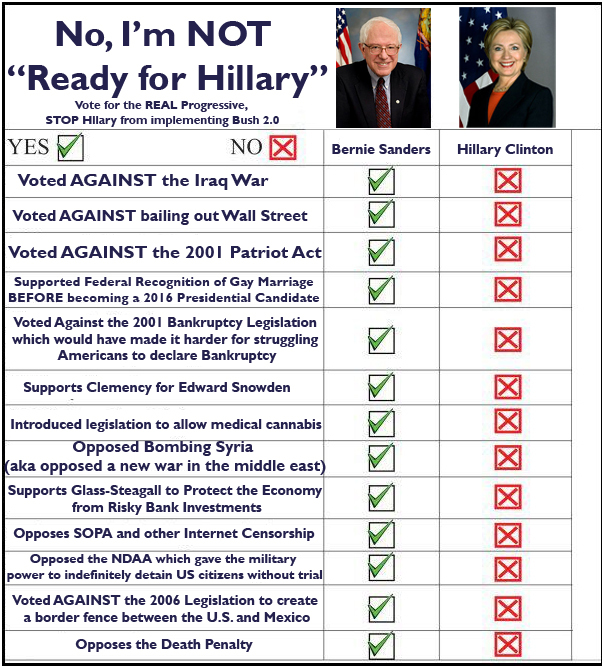 The only Democratic candidate supported mainly by small donations is Bernie Sanders. Among Republicans, Ben Carson, Donald Trump and Mike Huckabee all received more in small donations than large. These figures don’t include contributions from Political Action Committees, or the amounts that the candidates spend out of their own money. Those are particularly important in the case of Donald Trump. This chart shows how both Republicans and Democrats have become dependent on wealthy donors during the past 30 or so years. In 1980, both political parties received well over half their donations from small donors—those who gave less than $1,500 in 2012 dollars. In 2012, they both received more than a quarter of their contributions from mega-donors–people who could afford to give more than $5,616. Mega-donors are expected to account for an even larger share in the 2016 election. So far 158 families, who’ve contributed more than $250,000 each, have contributed $176 million to the campaign. Together with 200 additional families who’ve given more than $100,000 each, that is more than half the reported campaign contributions. But, as Ben Carson shows among the Republicans and Bernie Sanders among the Democrats, big money is not invincible. A sufficiently popular candidate can raise as much in small donations as their rivals can obtain from a few super-rich people. How Did the Democrats Become Favorites of the Rich? by Thomas B. Edsall for The New York Times. The Families Funding the 2016 Presidential Election by Nicholas Confessore, Sarah Cohen and Karen Yourish for The New York Times. Why is there no real party of the people? A conservative Christian writer and blogger named Rod Dreher is disgusted with how the Republican Party serves the interests of Wall Street and the military-industrial complex. But he won’t vote for the Democrats because he is opposed to gay marriage and abortion rights. He wonders why there can’t be a party that represents the interests of the common people on economics and the views of the common people on social issues? The reason why economic and social issues are aligned the way they are is the power of big money in politics. Barack Obama, Joe Biden, Hillary Clinton and the other Democratic leaders are strongly pro-business. But they can never be as pro-business as George W. Bush, Mitt Romney or the other Republican leaders. So in order to appeal to rich people, the Democratic leaders have to differentiate themselves on non-economic issues. A Wall Street banker or Silicon Valley CEO who was gay or female or an immigrant or a marijuana user, or had relatives or friends who were, would prefer Democrats to Republicans unless the Democrats were an actual threat to their wealth and power—which Democrats have not been for decades. Social issues work the other way for Republicans. Abortion, gun rights, immigration and gay marriage are issues that enable the GOP to appeal to middle-income voters who might otherwise vote Democratic. And, in fact, many Democrats would prefer to campaign on these issues than press for raising the minimum wage, breaking up the too-big-to-fail banks or preserving Social Security and Medicare. 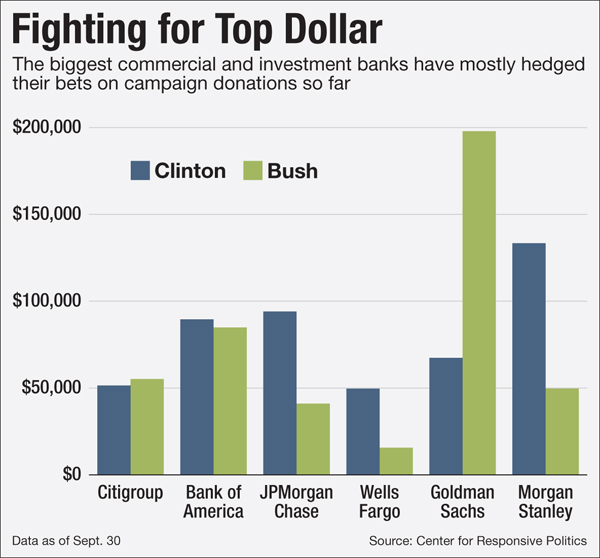 Hillary Clinton has so far raised more money than any other candidate of their party. 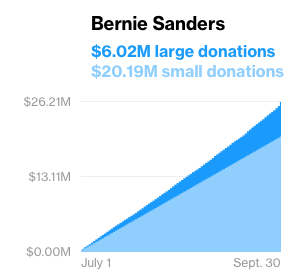 Bernie Sanders has so far raised more money than any Republican candidate. 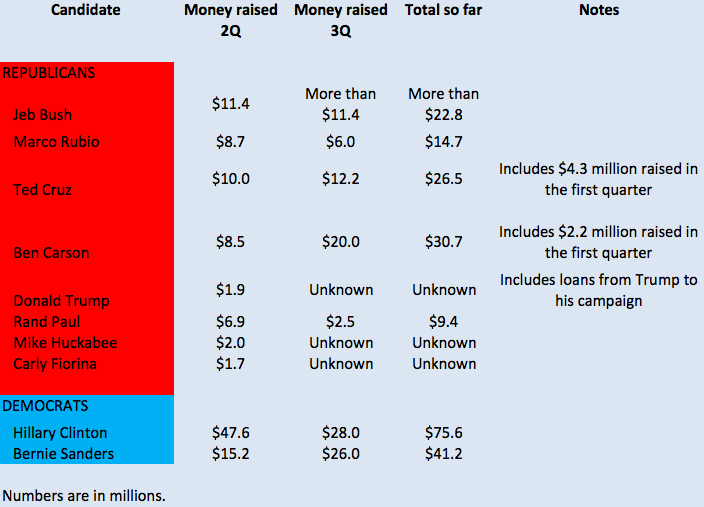 Ben Carson has so far raised more money than any other Republican candidate. Ted Cruz has so far raised more money than Jeb Bush. Now these figures are incomplete because the candidates have until October 15 to report the totals. When they do, the Republican candidates’ totals may well exceed the Democrats’ totals. 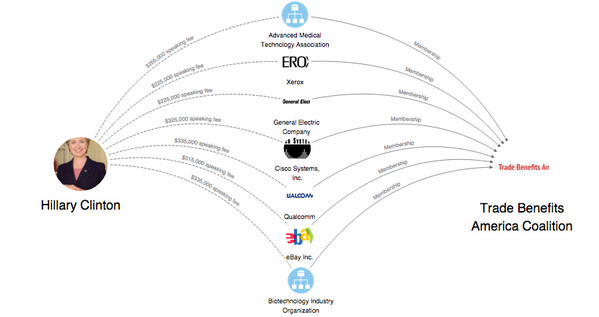 The figures also omit supposedly independent Political Action Committees. Still, I think it is significant that Bernie Sanders and Ben Carson have been able to raise so much from small donations. Sanders and Carson (whom I do not support) show that a middle-class person can run for President without having to beg for money from the super-rich. Bernie Sanders Is Awash In Cash From Individual Donors by Emily Atkin for ThinkProgress. Ben Carson raising millions to become fund-raising juggernaut by CBS News / Associated Press. The GOP Establishment’s Sneaky Ben Carson Fundraising Ploy by Russ Choma for Mother Jones. An indication of Dr. Ben Carson’s grass-roots appeal. 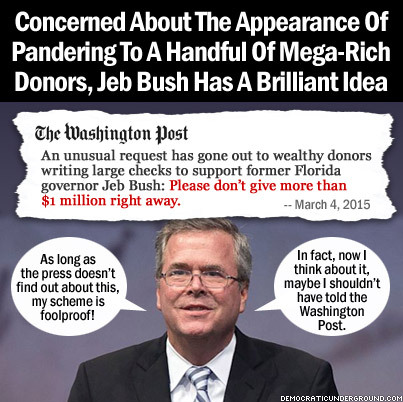 Most contributions went to “outside” pro-Bush groups that supposedly and in law are independent of his campaign. Hillary Clinton in her book, Hard Choices, endorsed the Trans Pacific Partnership. If she makes any statements appearing to back off from that position, I’d read them like a lawyer looking for loopholes. She’s been paid more than $2.5 million—actually, more than $2.7 million—in speaking fees by companies and organizations that lobby in favor of the TPP. 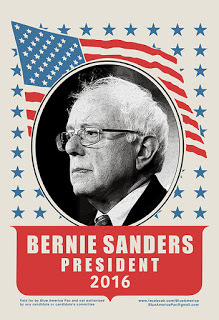 Bernie Sanders and Martin O’Malley, two other Democratic candidates for President, are opposed to the TPP, as are Republican candidates Mike Huckabee and Donald Trump. Republicans Jeb Bush, Ted Cruz, Rand Paul and Rick Perry support the TPP. I think the TPP is a terrible idea because, based on information now available, it appears to lock in a corporate wish-list as international law. International corporations, but no other entities, would have the right to appeal to a special tribunal against laws they deem unfair, and the tribunal would have authority to fine governments for allegedly unfair laws. At the very least Congress should have time to discuss and debate it fully rather than having it rushed through on fast track. Groups lobbying on trade paid Hillary Clinton $2.5 million in speaking fees by Julianna Goldman for CBS News. 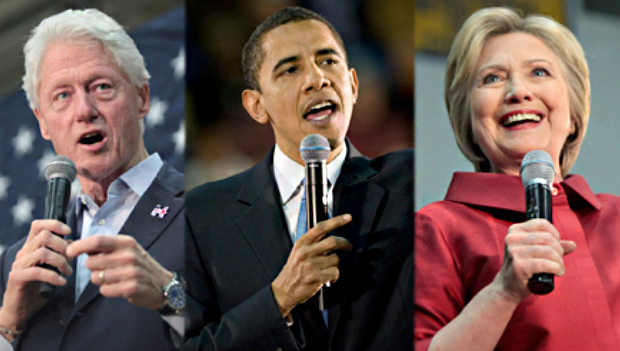 TPP Agreement: Where Do 2016 Presidential Candidates Stand on the Trans Pacific Partnership? by Howard Koplowitz for International Business Times. Donald Trump slams Pacific free trade deal by CNN Money. Trump appears to be right for wrong reasons. Like some TPP supporters, he talks as if the TPP is mainly about free trade. Here are links to interesting articles I’ve come across recently. I may add links during the day. The comment thread is open to general and off-topic comments. Businesses Flee Catalonia, Foreign Investment Plunges as Confrontation With Spain Comes to a Boil by Don Quijones for Wolf Street. The Mother of All Storms Builds Over Catalonia’s Independence by Don Quijones for Wolf Street. A coalition of parties in Catalonia say they will declare independence from Spain if they win the provincial elections September 27. Madrid will not recognize the results if the vote is “yes”, so the worst case possibility is a new Spanish civil war. ECB’s economic hitmen on the unbalanced evolution of homo sapiens web site. The Costs of Accountability by Jerry Z. Muller on The American Interest. Governments justify turning over decision-making to central banks on the grounds that they are thereby substituting objective metrics, benchmarks and performance indicators for fallible human judgment. But at best, these metrics are human judgement once-removed and, at worst, masks for covert human agendas. Who is Jeremy Corbyn? An international reader’s guide to the British politician by James Walsh for The Guardian. Jeremy Corbyn’s supporters aren’t mad – they’re fleeing a bankrupt New Labor by Owen Jones for The Guardian. Jeremy Corbyn, the emerging new leader of the British Labor Party, seems a lot like Bernie Sanders. He is an aging, formerly obscure member of Parliament who wants to return the party to its original principles. His strong grass-roots support surprises and alarms the entrenched party leaders. Four PACS – supposedly independent Political Action Committees – have raised $39 million on behalf of the presidential candidacy of Senator Ted Cruz of Texas. But only a trickle of that money has been released to the Cruz campaign. Why would a PAC collect money and hold it back? One answer is that it is a way to keep the candidate in line. Act in a way that is pleasing to the millionaires and billionaires who give to the pact, and you get your money. Displease them, and your campaign is cut off. I can only speculate as to what Ted Cruz has done to displease his political benefactors—whether he has been acting too crazy, or not crazy enough. But if campaign financing law continues as it is, I think political campaign funders are going to become more obvious in the way they exert control over candidates. 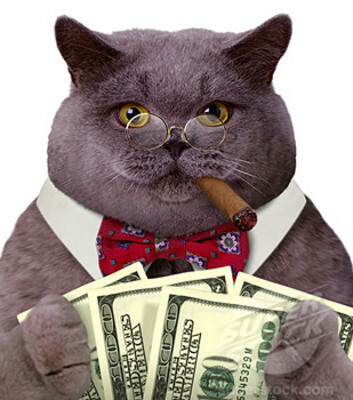 Ted Cruz’s Super Stingy Sugar Daddies by Betsy Woodruff for The Daily Beast. Small Pool of Rich Donors Dominates Election Giving by Nicholas Confessore, Sarah Cohen and Karen Yourish for the New York Times. 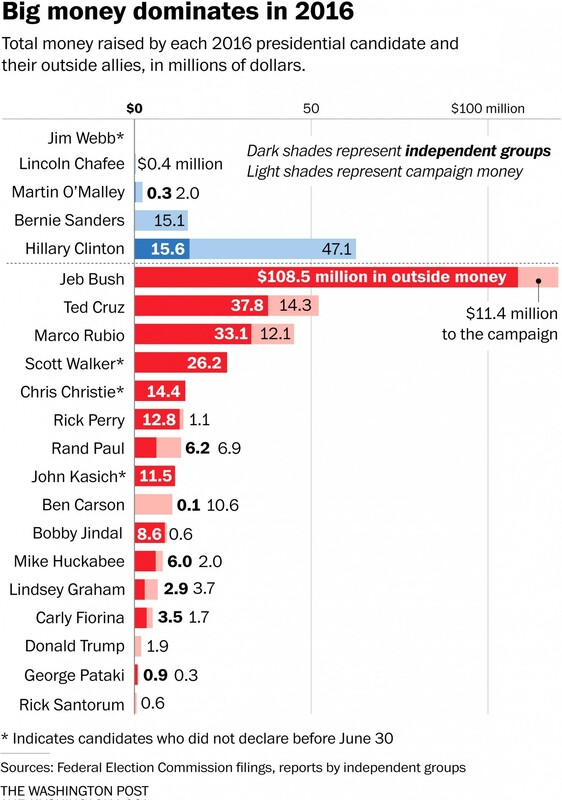 Million-Dollar Donors in the 2016 Presidential Race by the New York Times. The New Holy Grail of Republican Primaries by Rick Perlstein for the Washington Spectator. 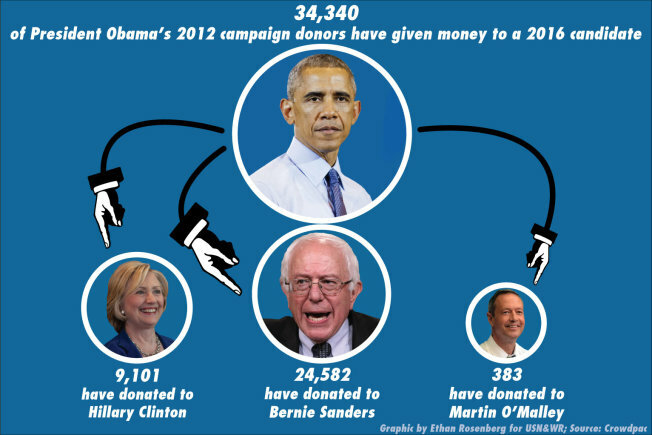 A new analysis shows that Bernie Sanders has received more donations from former Obama donors than Hillary Clinton has. And Marco Rubio so far has a bigger share of former Romney donors than any other Republican candidate has. 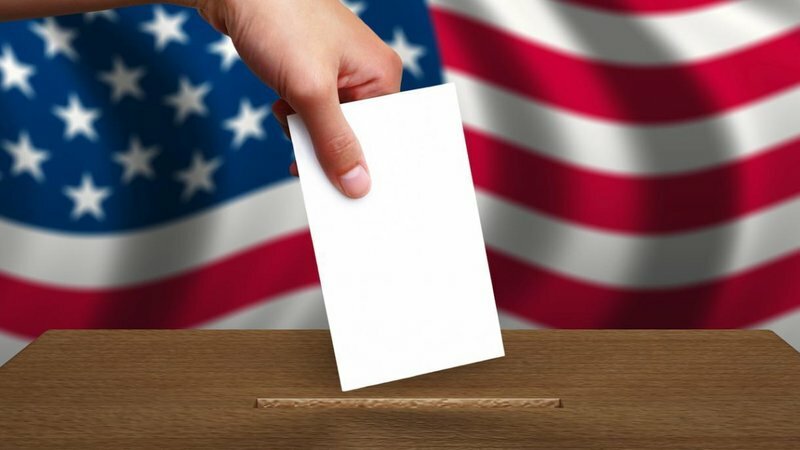 Crowdpac, a political research organization cited by U.S. News, reported that, out of the 9,302 Romney donors who have contributed to 2016 candidates so far, 2,891 made contributions to Rubio, 1,840 to Ted Cruz, 1,562 to Jeb Bush, 511 to Ron Paul and—get this!—280 to Hillary Clinton and 276 to Bernie Sanders. This is an interesting omen—no more than that. Neither Sanders nor Rubio is winning either the overall money race or the public opinion race. Liberal Democrats like to talk about the foolishness of rank-and-file Republicans who vote against their economic interests. But I think this is no less true of liberal Democrats themselves. The Obama administration, as much or more than the Bush administration, is committed to furthering the interests of Fortune 500 CEOs and Wall Street bankers at the expense of the general public. And a Hillary Clinton administration, based on her record and her sources of support, would be no different. Just one example, out of many, is Obama’s and Clinton’s support for the Trans Pacific Partnership and other trade agreements that limit the ability of governments to legislate to protect labor, public health and the environment. 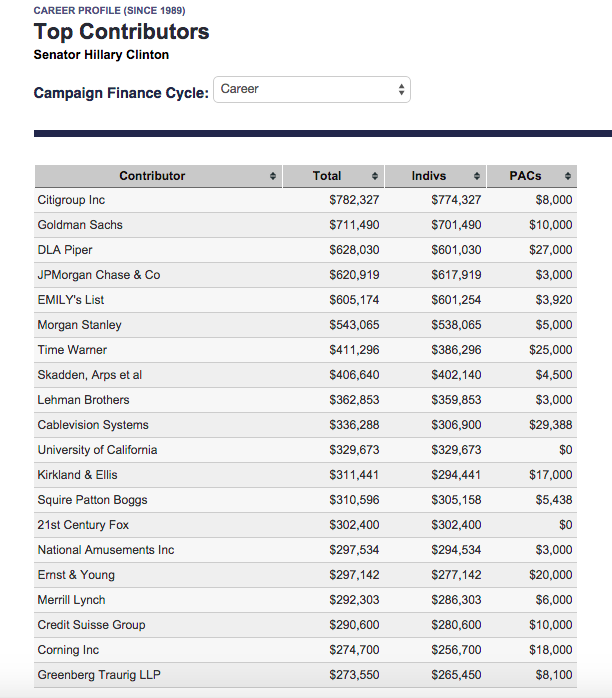 The chart from the Center for Responsive Politics shows the affiliations of her top campaign contributors from 1999 to the present. They are all connected with Wall Street banks, corporate law firms and Fortune 500 companies, except for Emily’s List, which supports women and feminist candidates. She is a rich woman because of six-figure fees she received from Wall Street financial firms for giving speeches. I don’t think they would have paid such fees except in gratitude for favors rendered in the past and expectations of more favors in the future. Now she has expressed concern about economic inequality and concentration of wealth at the top, but I think her associations, her sources of campaign funding and her record are better guides to her thinking than her campaign rhetoric. This is not to say that there are no disagreements between Democrats and Republicans on economic policy. But I think these disagreements reflect disagreements among the corporate elite. The Koch brothers have a different political philosophy than Bill Gates. Some members of the economic and financial elite are willing to do things to alleviate economic distress, and others aren’t, but neither will tolerate a candidate that threatens their economic and political power. 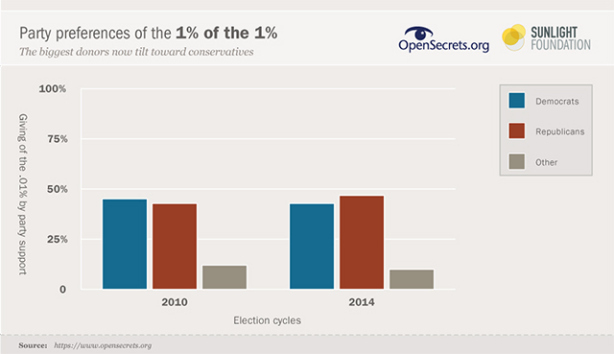 The top 1 percent of the top 1 percent of the U.S. population—fewer than 32,000 people—are increasingly the gatekeepers of American politics. 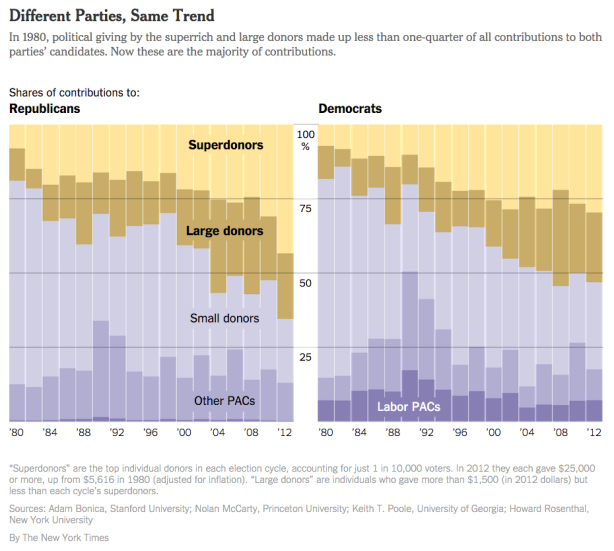 As elections grow more costly, super-rich campaign contributors grow more powerful. Last year, according to a report by the Sunlight Foundation and the Center for Responsive Politics, this small group of people accounted for 29 percent of all campaign donations. Within this group, there were 135 who gave $500,000 or more, 63 who gave $1 million or more, and three who gave $10 million or more. The top giver was Tom F. Streyer, a liberal San Francisco hedge fund manager and environmentalist, who put more than $73 million into anti-Republican PACs. While most individuals gave mainly to one political party or the other, the elite donors are fairly bipartisan as a group, as the chart above shows. Wealthy lawyers, environmentalists and executives of non-profit institutions give mainly to Democrats, while oil and gas industry employees give mainly to Republicans. Wall Street gave more than any other industry, with substantial amounts to both parties but more to the Republicans.. The Political One Percent of the One Percent in 2014: Mega Donors Fuel Rising Cost of Elections by the Center for Responsive Politics and the Sunlight Foundation.